Despite his family’s baffling generations-old ban on music, Miguel (voice of Anthony Gonzalez) dreams of becoming an accomplished musician like his idol, Ernesto de la Cruz (voice of Benjamin Bratt). Desperate to prove his talent, Miguel finds himself in the stunning and colorful Land of the Dead following a mysterious chain of events. Along the way, he meets charming trickster Héctor(voice of Gael García Bernal), and together, they set off on an extraordinary journey to unlock the real story behind Miguel’s family history. 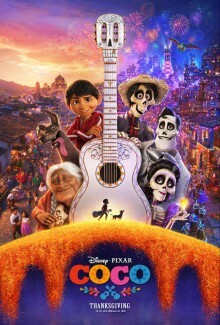 Join LatinoScoop at an exclusive advance screening of COCO in select locations below. Register for a chance to win a pair of seats at the advance screening in your city. LatinoScoop will randomly select winners in each city. Winners will receive a pair of GUARANTEED seats (seats MUST be claimed at least 45 mins prior to the start of the film). To enter, please send an email to screenings@LatinoScoop.com with your name, email and phone number. Please include YOUR city request in the subject line. Winners will be selected and notified via email on, November 20. Winners names will NOT be posted. Please check your email on Monday, November 20 after Noon CST. Only winners will be notified via email. Advance screenings will take place in the following locations listed below. All advance screenings will take place on Tuesday, November 21 in all locations listed below.